Derek McGarry and John Fogarty, NCAD describe the creative process behind the design of a unique typeface and logo that complements the objectives of the WISER LIFE Project while paying homage to the heritage of the local community. Creating a bespoke typeface for the WISER LIFE project meant first looking at what would be appropriate for the environment of the Boiler House. In order to do this it was important to look at the building and what was there already in terms of inspiration. Some of the existing type in the building was on the machinery, which was machined and pressed into plastic panels. This type had an interesting look and created the foundation for the machined look on the finished typeface. Once this aesthetic began to shape the letter forms, the height of the chimney became a signifier; relating the building to the logo. To keep this visual relationship the caps height of the letters became more elongated. This is most apparent in the capital O and helped bring a relationship among other letters such as C and D.
We were influenced by examples of well mastered signage including the London tube station and the Berlin U-Bahn, it was important to keep the typefaces clear by making it wide as a sans serif with thick strokes. Once started, each letter form had to be judged optically against one another and then optically altered to create a more balanced look. 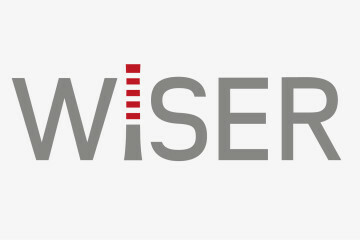 WISER LIFE signage will only be used as an uppercase typeface and complemented by the more traditional typeface Baskerville. Once in use throughout the building, it will help set the tone of modern thinking that will complement the educational space and research ethos. 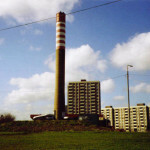 The WISER LIFE logo helps demonstrate a clear connection between the letter forms and the chimney, which will serve to reinforce the building as a landmark in the greater area of Ballymun and serve as a directional tool for people visiting the centre. 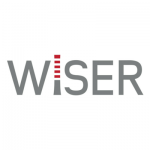 As the WISER LIFE project moves forward , it is paying homage to the past of the local community through thoughtful research and informed design.